For some of the eighteenth and twentieth centuries and most of the nineteenth, "romantic" music dominated the concert halls of Europe and America. Ever expanding the scope of musical grammar, it sought to express deeply felt emotional states, tell rousing stories, and evoke beautiful pictures. The works of its composers remain among the most universally enjoyed in the classical repertoire. While Naxos's critical history of the era is cursory, on the plus side, the recording contains spirited musical illustrations. Critical analyses of individual compositions are clearly stated and illuminating. Narrator Jeremy Siepmann has a pleasant, mature British sound. He employs it in a documentary style that is placid but never dull. Amid a background of wars and revolution, the 19th century produced many of the world's best-loved composers, including Beethoven, Brahms, Chopin, and Tchaikovsky. 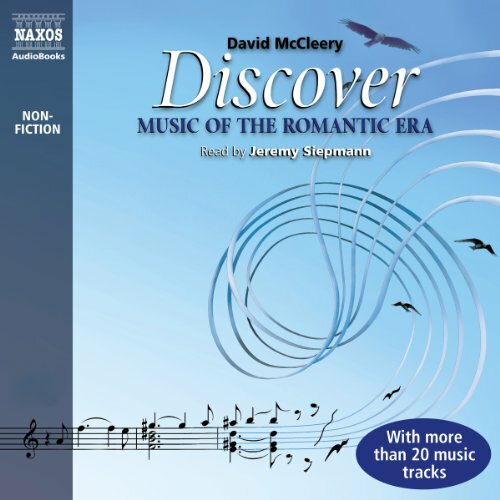 Discover: Music of the Romantic Era charts the course of music through those turbulent but exhilarating times with 40 music excerpts. Light-hearted but authoritative, it tells the fascinating, often scandalous life stories of the 19th century's greatest composers and describes how they created musical history.